Suitable for cooling fans or water pumps up to 4 Amps maximum current rating. An adjustable temperature thermostat with a digital readout. The control module measures 70 x 50 x 20mm and has three push-buttons for setting the required ‘ON’ and ‘OFF’ temperature. It has a digital readout of the current temperature and a Red LED which lights when the switched output is on. It has a 3 metre lead with a TemperatureProbe at the end. The Probe can be secured in the airflow of your radiator or taped to the outside of a coolant hose. IT MUST NOT BE PLACED IN LIQUID. 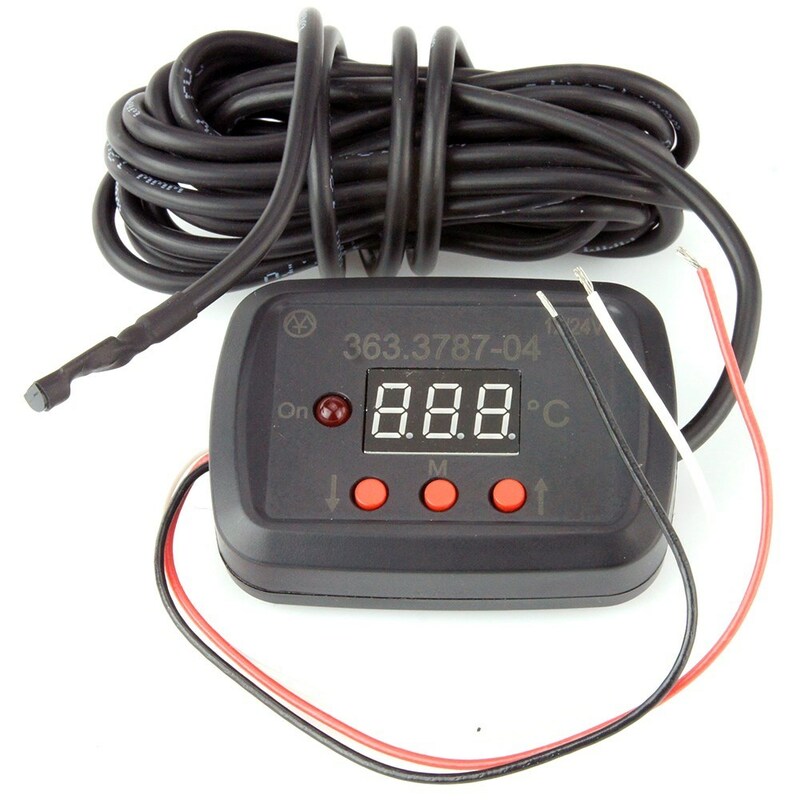 Temperature range -55ºC to +125º C.
WHITE - + 12V Switched live output to Fan or Pump. Maximum current on switched circuit is 4 Amps. NOTE: For bigger loads use this output to switch another relay. RED - +12 Volt in from Ignition live (or permanent live if you require fan to run on after ignition is turned off.). 1. Press ‘M’ button to begin ‘ON’ temperature setting. Use ‘UP’ and ‘DOWN’ buttons to set the temperature. 2. Press ‘M’ button again to begin ‘OFF’ temperature setting. Use ‘UP’ and ‘DOWN’ buttons to set the temperature. 3. Press ‘M’ button again to save the settings to the memory.